Good Morning Angels: 15-year-old Leila fights the odds to meet Ed Sheeran! Fifteen-year-old Leila Durr from Pretoria loves life, but she has been diagnosed with the incurable neuromuscular disease. Fifteen-year old Leila Durr from Pretoria loves life. She’s keen on learning new languages and, like most teenagers, enjoys hanging with her friends and listening to music. Despite battling a life-threatening disease, that’s made her dependant on a wheelchair, Leila attends a mainstream school and participates in school activities as much as she can. Leila has been diagnosed with the incurable neuromuscular disease called, “Friedreich’s Ataxia (FA). The disease causes degeneration of the nervous tissue in the spinal cord, which is why Leila now needs a wheelchair to get by. Over time, the disease will also lead to her losing her hearing and eye-sight. Because music plays a big part in her life and Ed Sheeran is her favourite artist, her parents asked Reach for a Dream to make her dream come true to see him perform live at the FNB Stadium. But then Reach for a Dream asked Good Morning Angels to make her ultimate dream come true: to meet her ginger hero in person. SPONSORING: Leila, her best friend, Elsje de Beer and parents Riana and Frans went to the Ed Sheeran concert at FNB stadium AGAIN on Sunday 24 March. Leila was one of the few fans who go the opportunity to meet Ed Sheeran backstage before the concert. She, in fact, had him on his knees! They took pics together, he signed some posters for her and chatted for a whole 5 minutes! SPONSORING: A brand new iPhone X for Leila! Reach for a Dream has received a request from a 15-year old Dreamer, Leila Durr. Leila is fighting an incurable neuromuscular disease called, “Friedreich’s Ataxia (FA). The disease causes degeneration of the nervous tissue in the spinal cord and Leila is now wheelchair dependent. Over time, the disease could also lead to her losing her hearing and eye-sight. Despite this, Leila lives life to the full. She goes to a main-stream school, loves learning new languages and music, with Ed Sheeran her favourite artist. Reach for A Dream has already secured tickets to the Ed Sheeran concert at FNB Stadium for Leila and her family on Saturday evening. However, a meet-and-greet would literally be a dream come true and inspire her to pursue the unattainable - in her case: living a full, positive life with what she's got. Meeting Ed Sheeran is Leila’s number 1 dream on her Reach for a Dream application. Her second dream is a family holiday in Mauritius and her third dream is an iPhone X! Leila would love to pursue photography or video editing when she finishes school. She is very adventurous and plans to skydive and swim with dolphins one day. 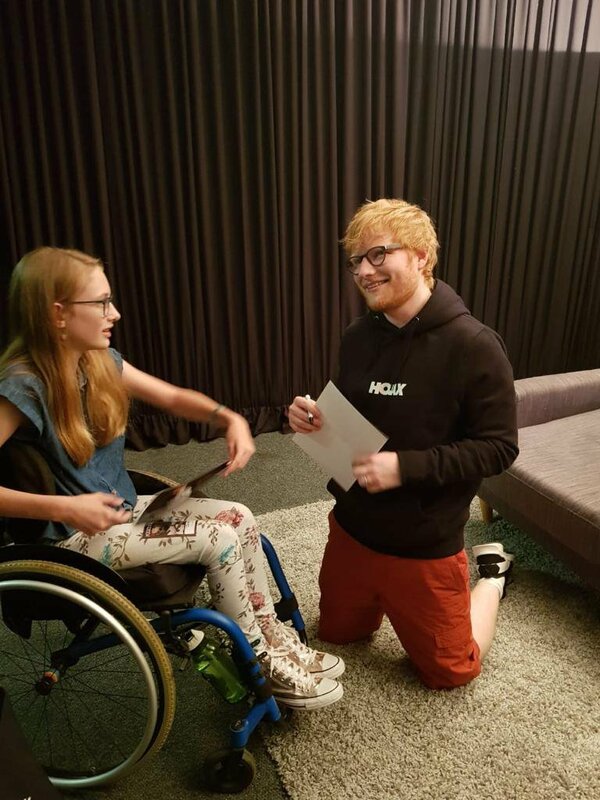 We believe if her dream of meeting Ed Sheeran can come true, it will inspire her to pursue all the other dreams she wants to fulfill in her life - despite her daily battle with a disease that has already impaired her mobility.